"Training our employees like that won't work. You have to be more strict with them. If they make a mistake, point it out! Point out their faults publicly to make them ashamed so they will improve." Certainly, this has never been a popular approach for motivation and constructive criticism highlighted in the Harvard Business Review, but this HAS BEEN told to me in several companies I have partnered with through Authentic Journeys in India. I learned the hard ways that some Indians tended to apply this strategy in a corporate situation. This was certainly the case in some of the 50 companies I consulted with in India. When I say I learned the hard way, I was also treated like a local. There were a few instances I was shamed by a manager in front of the group to get their desired outcome or to change my behavior. Anyhow, after reading Neil's article, I have considered a few points to share with you on motivation, praise, and criticism. I was coaching an Indian manager with 25 plus years experience in logistics. He wanted to motivate his staff. I asked, "Could you praise individuals who have done well through achievement awards?" His response was, maybe the new generation would be privy to this, but the more experienced employees may get jealous of those who were praised, and those who get praised would come to me demanding for a raise (in his words, 'pay hike'). Then, I suggested how about praising the team for their great work as a whole, pointing out what they did well, and noting how it's improved the company's bottom line (a great tip straight out of Harvard Business review). He again wasn't happy with my suggestion. He said, "If I mention company's bottom line, they again will come to me and demand a raise as the company is doing well." In the end, he used indirect group motivators mixed with a bit of criticism to motivate the people to do better in what they lacked this time around. The irony here is that though India is known as a group culture and the US an individualistic one, individual motivators tend to work better in corporations in India, while group or team motivators work better in the US. 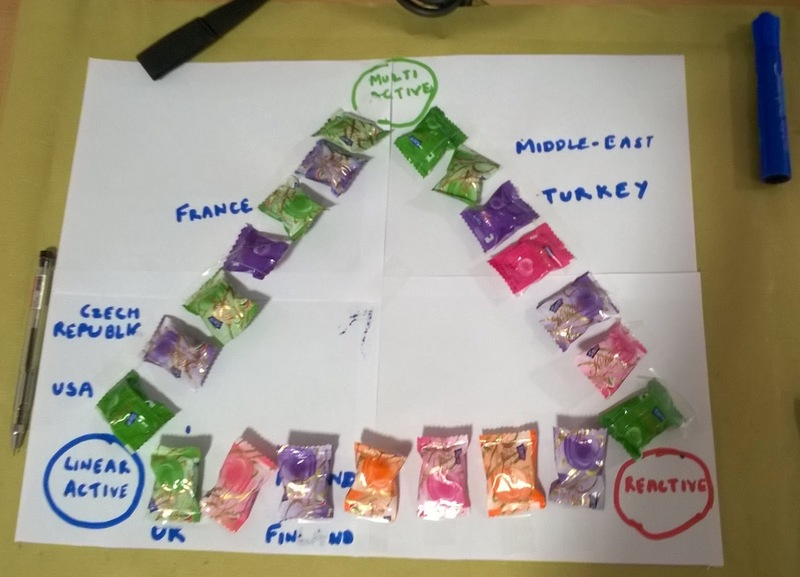 Learning about cross-culture models and gaps with the Lewis Model- and CANDY! Learn more about a "Cross-Cultural Approach to Learning"
Prizes or candy is a common feature of many training programs I deliver. However, prizes must be given to everyone, not just the winner. I had a few cases where I gave prizes out only to individual winners or winning teams and did not give anything to the non-winners, and got bad feedback on my evaluation. Well, I did a good job delivering the training, but on the feedback form it would say, "Some team members got a prize or candy, but I did not." Leaving a group with a feeling of 'not liking a person' is not good to do in India. The relationship (liking) is more important than the task in many cases (as seen through a Western lens). So, the main thing is we need to leave the group feeling good. If they feel good, they will learn more, and give good feedback. In the US, this affinity principle is not so overt. People really don't "care" if they like the trainer, they will worry more about the delivery of the training or the quality of the information (not that is not important in India, but it's valued differently than the relationship). So, due to this, I bring prizes or candy for everyone in many sessions where we play games. Winners may get a slightly bigger candy bar than the runners up, but everyone will get something. If I give one thing to one person, I have to be ready to give it to everyone. Interestingly, again in the US, there is not a value put on this in a professional environment. In this article, an American manager tries to motivate her Indian team by saying "If we finish this now and get this stressful part over now, we can relax later." I doubt this approach would work with many in India. This phrase on it's own shows the US or Western approach toward time (that it's linear) and destiny or self-determination (we can control the future). Both, not really popular or understood ideas in India. Plus, with the way time shifts from moment to moment in India, people may not trust in this approach. Frankly, after living in India for four years, I would not believe this either! Though, if used in the US, I would believe it. Since originally writing this in 2015, I have heard a few more stories like this from other parts of India. For example, in a central Indian based MNC, during a town hall when the manager mentioned the company's growth, one of the 1,000 attendees stood up during the question session and said, "I heard it mentioned that the company's growth is much better than expected. When will see this reflected in our pay?" I have actually seen that in some teams criticism done publicly motivates the team because they don't want to be shamed. But, rather than criticize an individual, criticize a group. However, I have seen individuals criticized, too (as in the example I started this article with, where I was publicly criticized). I think the idea is, "See the manager's job is to make us better, and if we are good, there's no point in giving feedback, only when we do bad he needs to point it out. That's his job." People may be motivated by fixing their mistakes rather than pointing out the positives and building off of those (anyhow this approach does take creativity). This approach also stems from the education system as a whole. Many teachers and parents in India motivate by pointing out mistakes or areas for improvement or where to make up lost marks, and not the positive aspects. These differences are overacted on many YouTube videos where Indians have recreated scenes of how Americans parents respond to "bad" grades compared to Indian parents. And, if you are an American in India and publicly criticized, It is very possible you will be humiliated, offended, and think it's not professional. Whatever you do, DO NOT talk back. Just take it. Just nod and say "ha" or "yes" in typical Indian style (where "yes" doesn't mean "I agree" but "I am listening.") Maybe later, depending on the manager, you could speak to him or her individually. Just do not ever talk back in front of the group. You will lose face, and the respect of your other team members. I have also learned this the hard way. Please share any other tips or contradictions to these points in the comments below. Thank you. This blog post is based on The True Secret to Motivating Indian Teams, a recent article by Neil Miller an American expat living in Chennai. After reading his post, I became motivated myself to share some feedback based on his observations. Author Jennifer Kumar is an American citizen who has lived as an expat in India twice for a total of 10 years. Six and a half of those ten years she spent running her own business in India providing business consulting, cross-culture training, and virtual team coaching. Based in Salt Lake City, she is also looking to work with your US based company to bridge the culture gaps to improve relationships, workflow and ROI. Contact us today.